Install the front seat cushion shield lower LH. Install the reclining adjuster inside cover LH (upper) with the screw. Install the reclining adjuster inside cover LH (lower) with the screw. Install the seat cushion pad to the seat cushion cover. Using hog ring pliers, install the seat cushion cover to the seat cushion pad with new hog rings. Cover the top of the seatback pad with the seatback cover. Using hog ring pliers, completely install the seatback cover with new hog rings. with Side airbag: Install the seatback cover bracket with the nut. 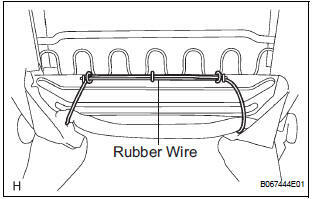 Attach a rubber wire with new hog rings, as shown in the illustration. 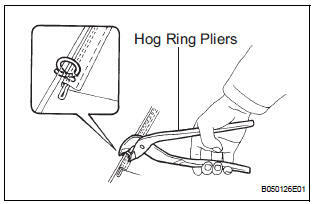 Using hog ring pliers, install new hog rings. Install the 2 headrest supports. Install the seat hinge cover. Install the seatback lock assembly with 2 bolts. Install the seatback spring assembly with 4 bolts. Install front seatback board RH. Install the reclining adjuster release handle. Install the armrest assembly with the bolt. Install the seat track cover front outer with the clip and 2 screws. Install the seat track cover front inner with the clip and 2 screws. Install the inner belt assembly with the nut. Torque: 42 N*m (428 kgf*cm, 31 ft.*lbf) HINT: Check that the inner sat belt assembly moves smoothly. Install the cushion shield inner.